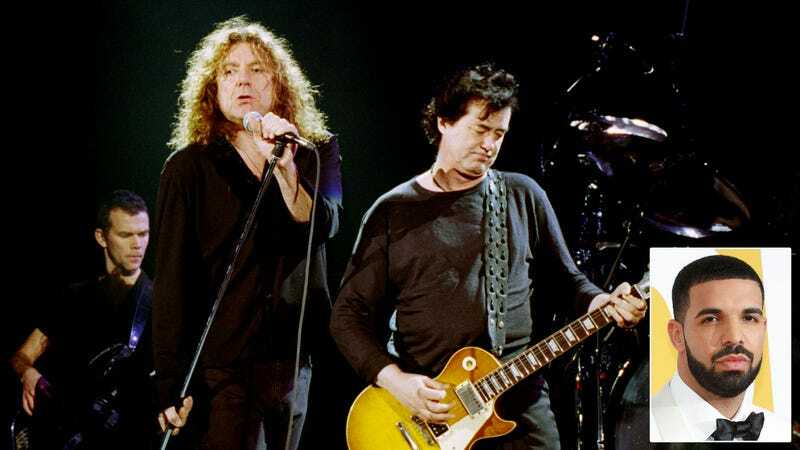 It looks like the bitter feud between Drake and Pusha T is only picking up steam as legendary rock band Led Zeppelin has now officially joined the fray by reuniting for the first time since 2007 to release a diss track aimed at Drake. Drake must be feeling the shade from all angles as this morning Jimmy Page, John Paul Jones, and Robert Plant released a statement on the official Led Zeppelin website announcing that they have spent the past day jamming in the studio and will soon release a new, eight-minute blues-and-hard-rock track calling out Drake for using a ghostwriter and donning blackface. “We are very excited to announce that Led Zeppelin is in the studio for first time in nearly 40 years recording a track that will shine some important light on the fakest ‘rapper’ in the game and feature a scintillating solo from the one and only Jimmy Page,” the statement read. Wow, this is getting ugly. Needless to say, hearing Robert Plant’s iconic crooning pile on the insults is not going to make Drake happy, but if this feud continues inspiring new work from these great artists, we’re 100 percent here for it.